This has been reposted from the Skeptical Analysis blog. This month, on the 18th, the NTS will host a discussion of this topic. Contact us and join the discussion on Skype. The term chemtrail is a portmanteau of the words “chemical” and “trail,” just as contrail is a contraction of “condensation trail.” Believers in the conspiracy theory speculate that the purpose of the claimed chemical release may be for solar radiation management,psychological manipulation, human population control, weather modification, or biological or chemicalwarfare, and that the trails are causing respiratory illnesses and other health problems.Contrails are formed at high altitudes (5–10 miles or 8–16 kilometers) and if any chemicals were released at such altitude they would disperse harmlessly and fall many hundreds of miles/kilometers away, or degrade before touching the ground. So “chemtrails” is a subset of “conspiracy theories,” itself encompassing JFK assassination theories, 9/11 cover up theories, black helicopters and the like. Conspiracy theories derive from a human personality quirk. Paranoia may be a necessary ingredient. The simple and more rational explanation is rejected in favor of one that quenches the thirst. So let’s see. For the past decade and a half the sky has been covered with a sun shielding haze emitted from high altitude aircraft. So with the billions spent on this covert activity it seems that “they” are forestalling the inevitable. Of course, this isn’t truly addressing the root of the problem, only treating a symptom (much the same as much of modern medicine). CO2 levels are still progressively building up in the atmosphere, oceans are becoming increasing acidic. But this “pause” in global temperature rise eliminates the perceived urgency of the problem, and allows climate change deniers to claim there is no problem. So is this clandestine activity actually helping, or is it in reality sowing the seeds of our destruction? Meanwhile the Greedy Lying Bastards keep feeding like pigs at the trough. Natural News (formerly Newstarget) is a website founded and operated by Mike Adams. It is based in Cedar Creek, Texas. It is dedicated to the sale of various dietary supplements, promotion of alternative medicine, controversial nutrition and health claims, and various conspiracy theories, such as “chemtrails“, the purported dangers of fluoride in drinking water (as well as those ofmonosodium glutamate and aspartame), and purported health problems caused by allegedly “toxic” ingredients in vaccines, including the now-discredited link to autism. The brains of everyone living within range of cell towers are being damaged by electropollution. Long duration contrails have been known since American bombers started flying high-altitude missions in World War Two. Contrails that persist for a long time are spread horizontally by wind shear. The supposed measurement of 6.8 parts per million of barium beneath a contrail hatch was erroneous due to misuse of the measuring equipment. Military organizations have never seriously considered using contrails to affect climate. Furthermore, there has been no serious effort at climate control by the military. Photographs such as the one below aid and abet these conspiracy stories. 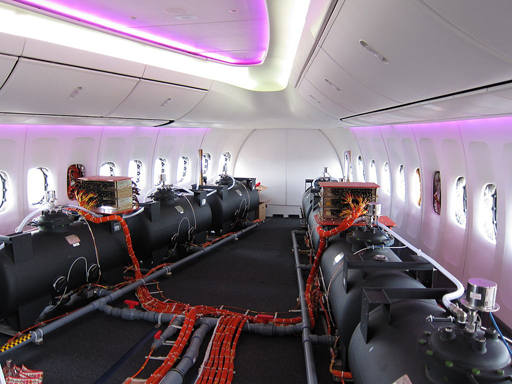 These are some ballast containers installed in a test aircraft. Water is pumped from one container to another to shift the center of gravity of the plane, but if you are of the proper mindset this is a setup for spraying chemicals into the atmosphere. Exposing aerial crimes and aerosol operations… …because it’s an emergency!! Since approximately 1998, thousands of people started noticing airplanes spraying X’s, parallel lines, and grid patterns across our skies. These trails initially look like contrails but actually aren’t. According to the U.S. Air Force, contrails are condensation trails and happen when hot engine exhaust momentarily condenses ice crystals into pencil-thin vapor trails that quickly vanish like the wave behind a boat, very much like your breath when talking outside on a cold winter day. Chemtrails, on the other hand, linger for hours and will spread out to form large areas of “cloud” cover. Why does Franklin Raines of Freddie/Fannie own the patent for a carbon trading computer originally owned by Carlton Bartels, CEO “Cantor Fitzgerald/CO2e.com/eSpeedprogram ? – a company whose employees were murdered by a well-guided jet aircraft that crashed into their offices on 9/11/2001? Wasting no time, why did the new Democratic Congress (2006) give the patent to Raines obamaimmediately following the election? It is statistically significant that 44 % of the souls murdered on 9/11 (including firefighters, police etc.) worked for companies that were in competition with the Chicago Climate Exchange. (CCX)? Al Gore, Obama, Maurice Strong, and whoever in Congress owns stock in CCX stands to cash in on $Trillions if they can pass enforceable Cap and Trade legislation. There is more to the chemtrails story than I can possibly unravel in a single post. Perhaps when I chance upon another ripe fruit I’ll share it with readers. In the mean time keep your eyes trained on the sky. And keep reading. While the link between fireworks and geo-engineering vis-a-vis chemtrails is well known in the scientific community, the phenomenon of placing lurid chemicals known to induce homosexual inclination is a development unique to the Obama Administration.